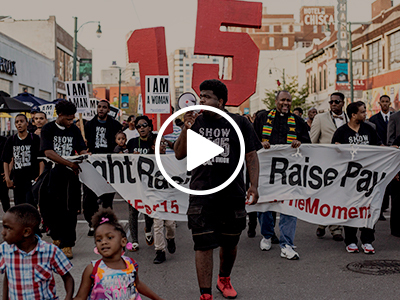 We are LIVE right now in Memphis, marching, protesting, making noise for $15 an hour, and union rights, and respect on the job regardless of race — watch. We’re carrying your signs – signs submitted by thousands of people from across the country. Signs declaring, I AM A MAN. I am a fast food worker. I am worth every penny. We are marching the same path that Martin Luther King Jr and the Memphis sanitation workers marched 50 years ago, as they fought for the very same things we fight for today: For fair pay of $15 an hour. For union rights. For dignity. For enough to live.